Iggy Pop is an artist who’s always cast a big shadow. His influence is central to the rise of punk rock and he pioneered a kind of performance as startling in its masochism as it was enjoyable in its spontaneity. Besides his landmark output with The Stooges, two of rock’s greatest albums ever, The Idiot and Lust for Life, also bear his name. It’s funny then that Post Pop Depression is an album in which Iggy allows himself to walk in shadows, rather than cast a bold new shadow of his own. That humble decision led to one of his best albums in decades. There’s the shadow of those two albums mentioned above and the death of one who was such an essential part of their creation: David Bowie. Bringing on Josh Homme as his collaborator this time around carries with it the sorrow and pain of the Paris attacks, given Homme’s role in Eagles of Death Metal. As per usual, the lyrics and subject matter herein are dark and shady, exploring themes of disfigured love and life in seedy motels in Germany and Paraguay, alike. This album isn’t so much about breaking new ground as it is about mining the ground that’s already been broken. Josh Homme’s enlistment was a stroke of genius on Iggy’s part. Homme’s output with Queens of the Stone Age has long trafficked in the Berlin-era sounds of both Lust for Life and Bowie’s famous trilogy of records. There are songs on Era Vulgaris and Like Clockwork… that sound apocalyptic and funky enough to have existed in some embryonic form back in the late ‘70s during those sessions. The guitars on songs like the appropriately named “German Days” or “Paraguay” really drive the point home that Homme didn’t need a lot of guidance on learning a vocabulary that Iggy already spoke fluently. Beyond the terrific guitars, the record is pretty stacked with great songs, too. All the lyrics, riffs, drum beats and whatnot perfectly serve each other; dominance and submission is no issue here sonically. Iggy may have made his name with lacerating and energetic proto-punk but even the more upbeat and dissonant songs here still possess a melancholy, balladic structure. “Break Into Your Heart” and “Gardenia” indicate early on that he can still come through clear as day even when the aesthetic itself is intent on being foggy. He’s had demented crooning down for a while and his talent hasn’t depleted over the years. The album recalls so many of his best old tricks while altering the presentation just enough to give it a necessary freshness. It’s yet another peeling-wallpaper masterpiece on his resume, working as well as a swan song should he really be quitting the music industry soon as much as it whets the appetite for more later should he change his mind. 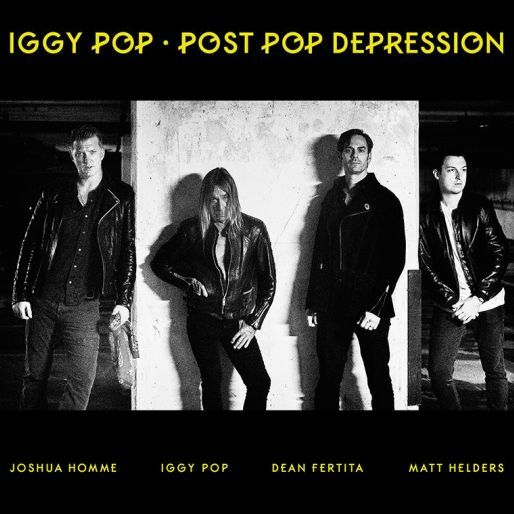 Post Pop Depression may be melancholy, but it ironically delivers a sort of timeless optimism in being a testament to Iggy Pop’s past, present and (hopefully) future creativity.